Ukes4Fun Song Sheets use the real names for chords, ie. how they sound on a ukulele tuned G-C-E-A, not what those chord shapes would be called if you were playing them on a Baritone ukulele or a Guitar. There are 10 Song Sheets in each Song Book. They look all nice and tidy in songbooks but I like to break up the books and file the songs alphabetically. This makes it easier for me to find individual song sheets quickly during sessions. If you prefer to keep the Song Books intact, the Song Sheets Alphabetical Index should help you to find a song quickly. The code before each song tells you which SongBook (SB) it is in and the SongSheet number in that book. eg. SB01-01 = Song Book 01, Song Sheet 01. There are links further down the page for downloading pdf files of the index in either portrait or landscape format. The “Borat-style” stuff is inspired by, ie. shamelessly nicked from, the TUSC Songbook. NOTE: If you want copies of the individual songsheets as txt files in CRD-type format, they are all here on Dropbox (2015-09-13 Link updated – used to be on Google Sites. You do NOT need a Dropbox account to download these files). If you want to “try out” a new song at one of the sessions, it does not need to be in a Song Book already. Try it out in different keys – some alternative keys will “work” and will keep the original sense of the song, some alternative keys will seem to change the meaning, perhaps in a way that you like, while other keys will make the song sound all wrong. If the song was written for the guitar then the original key might not work on the ukulele and a different key might sound better. Practice it at home until you are ready to have a shot in public, because you will be leading the playing and the singing. Bring along at least 10 copies for other people and/or send a file by email to the Ukes Google Group. (Not everyone is on email though). Tell Dot before the session starts that you have a song that you want to try out. If your song is played regularly then it would be really helpful to include it in a Song Book. If you take your song off chordie.com, for example, select “Chopro” (next to the Print button) and then copy and paste the song sheet into a text editing program – or straight into the email. Even with all the chords nicely in-line and in square brackets, I still need to spend quite a bit of time getting the rest of the formatting sorted out. So I would be very grateful for your help and cooperation with this. Finally, many thanks to Charlie, Andy, Nick, Niccola, Denis and Jazzy for contributing individual song sheets and for helping to iron out the bumps and crinkles in various versions of song sheets found on the internet. Rita also helped me a lot, by simplifying some unnecessarily complicated song sheets and kicking many over-fussy passing-chords into touch, and I miss her clever ear for the bones of the melody! The A4 Landscape versions proved more popular than portrait. They can be cut up and stored in an A5 binder to save space on the tables – and leave more room for beer! Lots of members, myself included, had problems reading the previous versions, due to the lethal combination of low lighting and elderly eyes. Some people also had problems printing the earlier versions that had the chord names in colour – the chord names just disappeared. The trial of alternative fonts resulted in a preference for APHont. So all the existing songbooks were updated and all songsheets, old and new, are now available only in Landscape, black print only, in APHont on this site. I am sure that there will be some mistakes and glitches in the songsheets – if any Ukes4Fun members spot anything that needs correcting, please let me know. The more proof-readers the better! You can find out when the Songbooks have been updated by subscribing to email and/or rss updates to this website. Songbook 7 added: Act Naturally, Geordie toons and 3 versions “Over The Rainbow” – from “Easy” to “YouKiddinMeOrWhat? 2 May 2011: Songbooks 1 to 4 now available in APHont (for easier reading) Landscape format (to take up less space) – see links on page above. Ukes4Fun Songbook 3: Ooops! 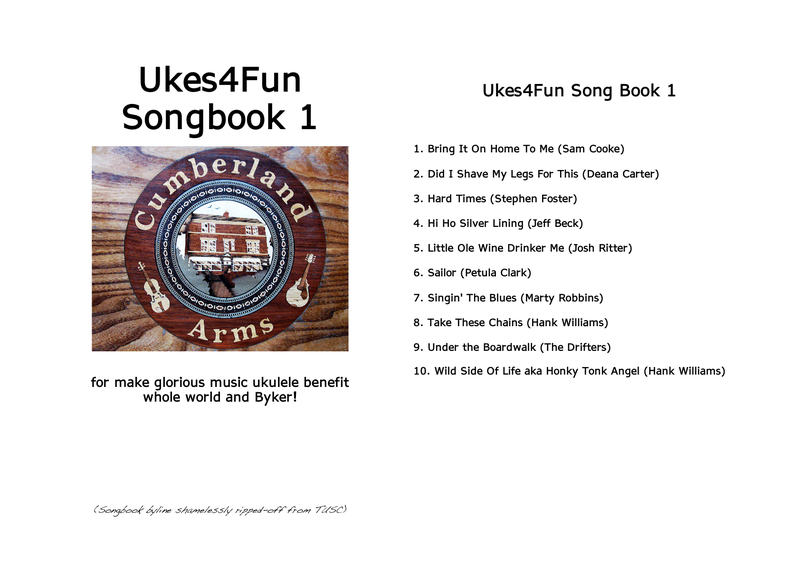 The Table of Contents was headed “Ukes4Fun Songbook 1”. I have amended the Songbook so the frontpage is correct and have updated the links above. “See You Later Alligator” – Key changed to C and intro updated. “Singing In The Rain” – verses 3 and 4 removed. 20th August 2010: Three songbook added – 10 songs in each. These replace the previous versions. Please see page above for further details. Good site lizzie, and getting better by the minute… which does n’t surprise me one iota. you are more than welcome to ‘take’ any music from ‘our’ Tune Army songbooks. Cheers Ritchie! :-) Charlie brought some of the Toon Army Songbooks along last Thursday – very impressive! I have got quite a few corrections to make to the ones I have already published here and a back-log of new ones to add. 1) “Bye Bye Love” removed – I used the wrong version. It will go back in when we have got it right.